I finally made it to my local farmers market this year. I know pretty sad, huh. I don't know what took me so long. I actually do love shopping at the local farms, stands and farmers markets for garden fresh produce. It is more of an experience, than a shopping trip. You get to see and smell all the fabulous fruits and vegetables bursting with color at their absolute freshest state! 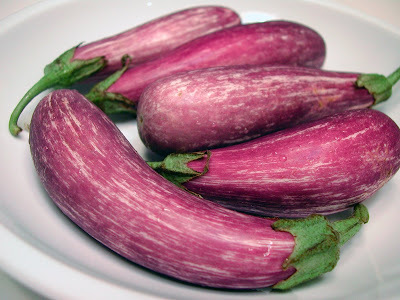 You also get to learn about produce that you've never had before, like the fairy tale eggplant. These beautiful mini purple and white eggplant caught my eye right away. And what a perfect name for them. They are so fun and whimsical that they could be in a "fairy tale". There were several "regular shoppers" of the farmers market ready to give out their recipes using this little gem. 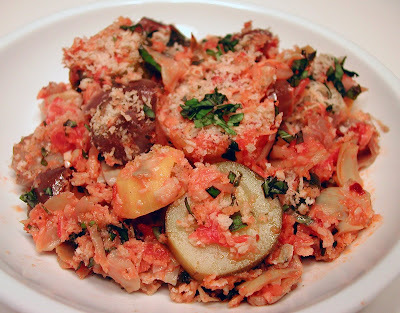 They all sounded great, but the one I liked the sound of, involved steaming the eggplant along with zucchini, summer squash, garden tomatoes, and fresh herbs together and then baking it all in a casserole with cheese. YUM! I came up with my own healthy version and it was fantastic! Place a heavy pan or dutch oven over medium heat; add the oil, shallot and garlic. Stir and cook until softened, about 5 minutes. Add the eggplant, squash, zucchini, artichokes, tomatoes, 6 tablespoons basil, 3 tablespoons parsley, pepper flakes, bay leaf, salt and pepper. Stir to combine; cover and cook over low heat until vegetables are softened, about 10-13 minutes. Spray a baking dish with cooking spray and add the vegetable mixture. 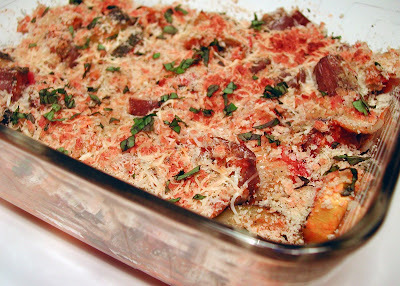 Top with the breadcrumbs and grated cheese. Spray the top lightly with cooking spray and place baking dish in oven. Bake for about 10 minutes or until breadcrumbs are golden brown. Sprinkle the remaining basil and parsley on top and serve. Looove farmers' markets - glad you finally had a chance to visit one! Jen cracks me up! I like reading her comments. The eggplant is gorgeous. I've never seen that variety before. This looks great. I'd pick this over meat. I love roasting or baking up a big pan of mixed vegetables. I am going to give your recipe a try after I visit the farmers; market this weekend. The title of this recipe is really cute :). I don't know how anyone can not like veggies after eating this, it sounds so tasty. I can definitely see myself using a ton of fall veggies to make something like this, great recipe :). We would love to feature it on our blog and the first and only digital recipe reader. Please email sophiekiblogger@gmail.com if you're interested. Thanks!